There are a number of things that are important to take into consideration when designing a timing belt and pulley drive. 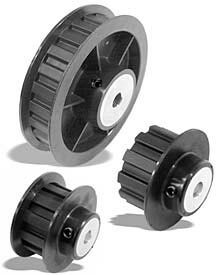 First, no matter what type of belt and pulley you need, make sure the drive system application is well defined. The supplier you are working with should have the knowledge and expertise to take your application and guide you through the specification process for the right drive components. What do you need to know about your application requirements? How much torque is required to do the work (output torque)? What is the input torque (the motor)? What is the input speed (rpm) and output speed; this is the speed ratio. What is the center distance between the input shaft and the output shaft? This will help determine the belt length. Is the application continuous rotation, stop/start, forward/reverse? Are there any industry guidelines you must adhere to such as clean room, food or medical? Timing belt type, pitch and length. 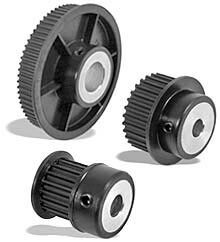 Correct pulleys to deliver torque and ratio. You as the designer must decide if you need single flange, double flange or no flange pulleys. Shaft size equates to bore size in the pulley. How the pulley is secured to the shaft, setscrews, keyway, or shaft locking device, etc. Some other design elements to take into consideration are things like the pulley material and any special finishes that might need to be included. Is inertia important, do you need a very light weight drive system? Your supplier or manufacturer should be able to help walk you through gathering these and any other specifications you might need for an effective timing belt and pulley design. However, we’ve created a guide to help you with this process. The Timing Pulley Purchasing Checklist is an excellent way to keep yourself organized throughout the timing belt and pulley design process. You can get a free copy of the checklist below. You can also contact us to learn more about our full range of timing belt and pulley solutions! This post was published on October 17, 2018 and updated on October 17, 2018.